Tired of looking through multiple website to see if they have posted the latest news? 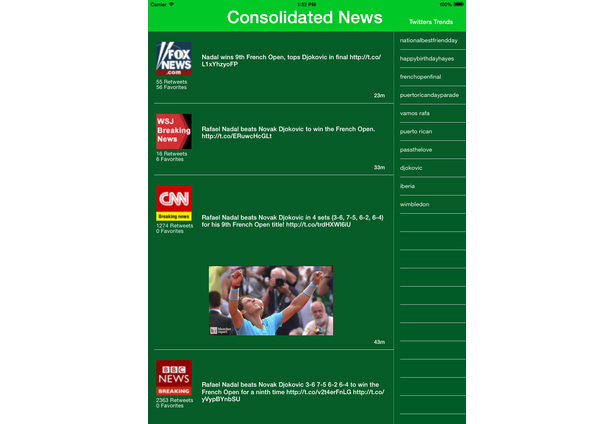 This app looks at multiple news agencies and groups them together by related words. Top news twitters are followed and the tweets are parsed to get similar words between the posts. These words are shown on the home screen so you can select which word is most relevant to what you are looking for. There is also a feature where you can also search the news tweets for trending topics for the US. Comments for this submission are closed. View the software in MarkN's portfolio to continue the conversation.